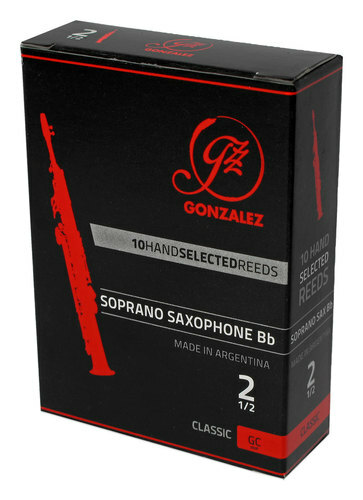 The Gonzalez Classic reeds are designed for the musician to quickly adapt to it, because they have a cut that has been used by most manufacturers (i.e. Vandoren Traditional style), but using the slightly longer aged cane that is present in all Gonzalez production and often yields more consistent reeds. They have a typical filed French cut, with a thin tip, that will be suitable for those types of mouthpieces with French style rolling facing curves.They have a fairly thin tip for easy response on these types of mouthpieces. For those experimenting the Vandoren equivalent = Traditional Blue Box. Suited to mouthpieces with French facing curve. Aged cane grown in the foothills of the Andes. Supplied in box of 10 reeds.